I was fortunate enough to have an extra day in Paris before I had to fly home from a work trip last month. 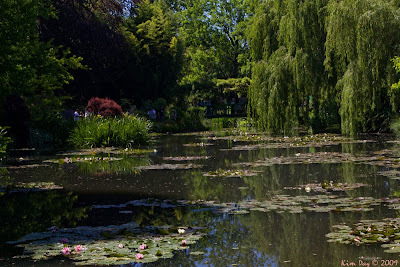 So, I took a tour out to Giverny where Monet painted his water lily paintings. It was a holiday weekend in France and the highways leading out of Paris were clogged with Parisians heading out to the Normandy beaches, compounded by the masses heading out to the French Open at Roland Garros. Watching the slow moving mass exodus was not unlike watching the natives flee Philly to the Jersey shore on the weekends and the traffic was just as bad. After a bit our guide gave up on the highways and we headed off on to the back roads of Normandy which were much more picturesque than the highways. We drove through quaint villages built into limestone cliffs. 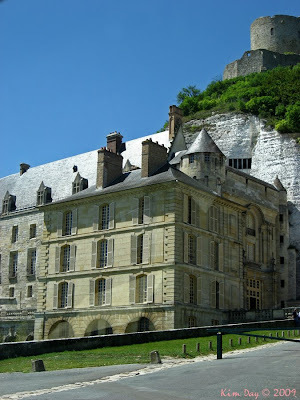 if you look closely behind the chateau, directly below the castle, you can see the windows peering out from the limestone cliff. 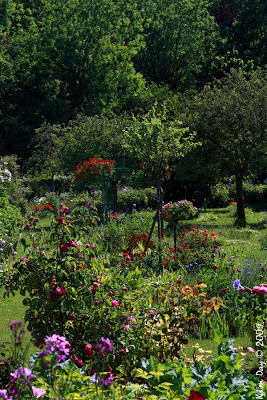 Finally, we arrived in Giverny. To get to the water lily ponds, you have to cross under the main road through a tunnel. The ponds aren’t huge; you can probably walk around the entire area in about half an hour. But, they are truly beautiful. After spending some time wandering around the gardens, it’s back through the tunnel to tour Monet’s farm house. 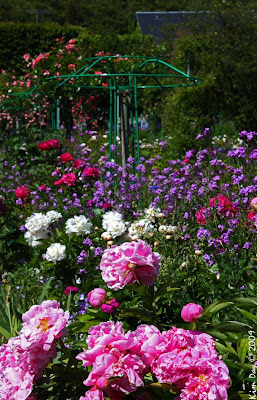 Before you get to the house you pass through a large garden that is a riot of color. The garden was filled with Iris (one of my favorite flowers). Every where you looked was a splash of color. It was almost overwhelming; your eyes didn’t quite know where to look next. No photos are allowed in the farmhouse, but it is filled with Japanese prints from top to bottom, many of which were originally used to wrap around dishes which Monet bought. There are also reproductions of a number of Monet’s most famous works which you can find in museums all over the world. This entry was posted on Monday, June 22nd, 2009 at 10:40 PM. 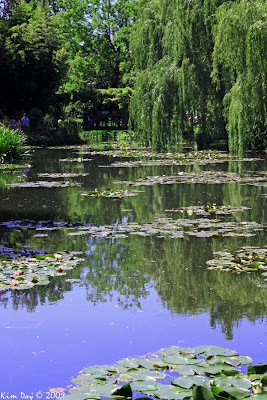 It is filed under France, Giverny and tagged with France, Giverny, Monet, water lillies. You can follow any responses to this entry through the RSS 2.0 feed.